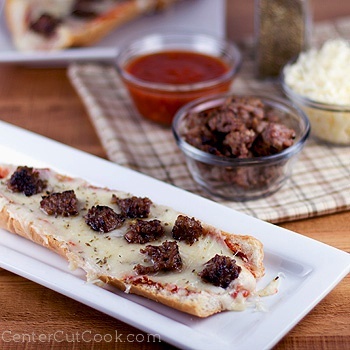 When it’s pizza night in your house and you want something quick, French Bread Pizza is the answer! It’s impossible to grow up in Chicago without trying some of the best pizza out there. I’ve had my fair share, that’s for sure, everything from Lou Malnati’s and Giordano’s to our favorite local pizza place called Angelo’s. And despite being surrounded by some of the best pizza available, pizza night in our house is often times the homemade kind. Now, it all honesty, it would probably be imposible for me to actually get sick of pizza. Even if I had the same crust/topping combo time after time after time. However, to keep things interesting, aside from switching up toppings, I like to switch up the type of crust we use. Here are the top three I tend to use most. These little French Bread Pizzas that we recently enjoyed are a great alternative to traditional pizza because they are quick! Depending on how crisp you like your crust, baking time can be as little as 5-7 minutes! You definitely can’t order pizza and have it delivered quicker than you can make these, that’s for sure. Note: This recipe is more of a method. I’m not going to list out how much cheese/sauce/toppings you should use because everybody has a different cheese to sauce to toppings ratio that they prefer. Of course, if you really want to switch up pizza night, you could always go for this ooey gooey Pizza Dip! Slice the french bread in half, and then cut each piece lengthwise so that you are left with 4 pieces of french bread. If you like thicker crust, leave the french bread as is. If you like a crispier crust, use your fingers to pull out some of the bread so that you are left with just a french bread shell. Brush each piece of bread with olive oil and sprinkle with a bit of garlic powder, then bake in the oven for 5 minutes. Remove the bread from the oven, spread sauce, then sprinkle Italian Seasoning on top of the sauce. Add cheese, and your favorite toppings. Sprinkle more Italian Seasoning or Dried oregano on top and bake for 5-7 minutes, or until the cheese is all bubbly and melted.